Determine the proper notice. A proper copyright notice includes three parts: the word "copyright" or the C-in-a-circle symbol, the year the pattern is first published and your name. For example: "Copyright 2012 David Hastings." Add a grant of rights, if appropriate. Technically, someone who cross stitches a design from your pattern creates a "derivative work," which is illegal without your permission. 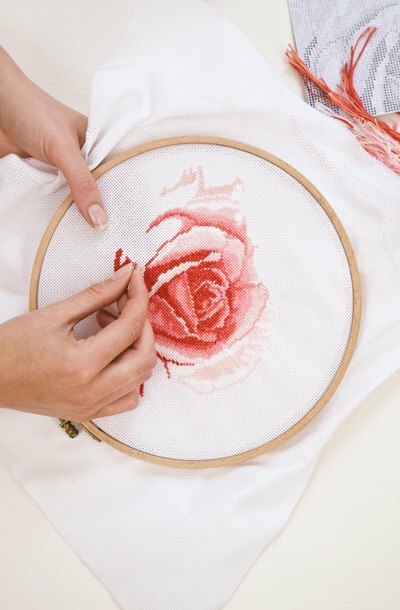 By giving or selling your pattern to someone, you give implied permission to stitch the pattern, at least for personal use. But that doesn't necessarily allow them to sell the completed project or make multiple projects from the same pattern.To clarify, consider adding language regarding permitted use. For example, "Copyright 2012 David Hastings. This pattern may not be used for commercial purposes without the designer's written consent." Add the notice to the pattern. It can go anywhere on the pattern, including the back, as long as it is "permanently legible to an ordinary user." Start an online application. Go to the "Electronic Copyright Office" on the U.S. Copyright office website and follow the directions to log in and begin the registration process. Fill out the online registration form. When the website asks what type of work you are filing, select "Work of the Visual Arts." Then enter the information the website asks for. If you have trouble filling out the form, you may want to consult with an attorney or online legal document service. Pay the filing fee. The Copyright Office will accept both credit and debit cards. You can find the current fees on the Copyright Office website. Submit a copy of your pattern. If the pattern has been published, which means you have distributed it to the public, you will need to mail a copy of it to the Copyright Office. The website will ask you for information about the mailing. If the pattern is unpublished, you can upload an electronic copy through the website. Once the Copyright office has processed your application, it will mail you a certificate of registration. Fill out the registration form. Print out a copy of Form VA and fill it in. If your pattern is completely new; it was not made for hire and you are the only author, you may be able to save some work by using Short Form VA instead. If the form is confusing, you may want to consult with an attorney or online legal document service. Prepare a copy of your pattern. If your pattern is unpublished, and you haven't yet produced a copy of the pattern as it will be published, you can use identifying material like a drawing or a printout instead. Submit your registration. Mail the registration form, the copy of your pattern and a check for the filing fee to the U.S. Copyright Office. It will send you a certificate of registration once it has processed your application.